Lisbon Valley copper mine facilities (looking northeast) under construction in September 2005. Note pregnant solution ponds on the left, crusher under construction in foreground, and the old Sentinel pits (white areas) in the middle distance. 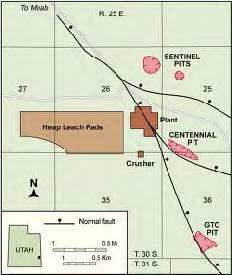 Utah’s newest copper mine at Lisbon Valley lies in southeastern Utah, about 40 miles southeast of Moab. Historically, Utah has been an important copper-producing state. The century of copper mining at Bingham Canyon, for example, has had an enormous economic impact on Salt Lake County, as well as Utah as a whole. Similarly, copper mining at Eureka (Tintic district) and Park City also proved to be important elements in the state’s economy through the mid-twentieth century. 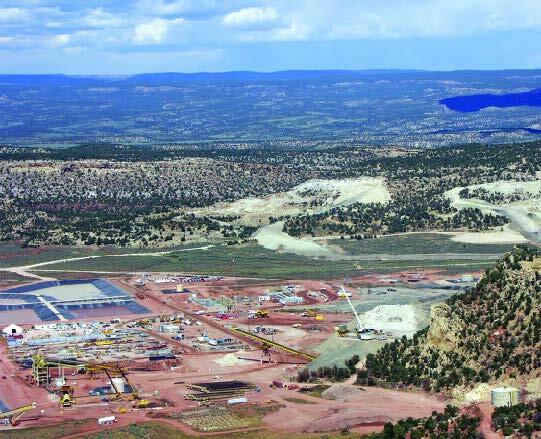 Now, the new Lisbon Valley copper mine is poised to give an economic boost to southeastern Utah. 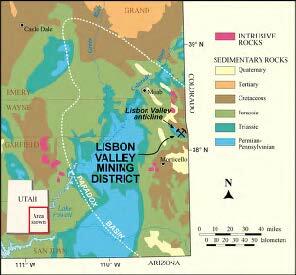 The Lisbon Valley district is localized on a northwest-trending, doubly plunging anticline (arch-shaped fold). Copper mining began in the area in 1903 at the Big Indian mine at the northwest end of the anticline; however, production was sporadic and insignificant until a 300-ton-per-day acid leach mill was completed in June 1918. The Big Indian was initially mined by underground methods, but switched to open pit operations during World War II. The Big Indian mine produced about 150,000 tons of 1.5% copper ore during the war. The Blackbird copper mine, at the southeast end of the anticline, shipped several thousand tons of copper ore to the Kennecott smelter north of the Bingham mine at Magna in the 1950s. The old Blackbird copper mine returned to production in the 1960s with construction of a 200-ton-per-day acid leach plant. Intermittent production continued into the early 1970s when all copper production ceased. The discovery of beautiful azurite mineral specimens near the Big Indian mine in 1978 resulted in the commercial collection of crystal clusters there into the late 1980s. Modern copper exploration, including extensive drilling, began in the Lisbon Valley district in the 1960s and continued through the 1990s. This work delineated the Lisbon Valley copper deposits around the old Blackbird mine. New mine plans were drawn up by Lisbon Valley Mining Company LLC, a subsidiary of Constellation Copper Company, and permitting began. In 2004, the final mining permits were issued and mine construction began in early 2005. Geologically, the northwest-trending, doubly plunging anticline dominates the Lisbon Valley area. A normal fault on the anticline’s northeast flank has roughly 1000 feet of vertical offset, down to the northeast. This fault has acted as the primary hydrothermal channel way for the rising copperbearing fluids that produced the deposits. Bleached sandstones of the Cretaceous Burro Canyon Formation host the typical Lisbon Valley copper ore body, with subsidiary mineralization in the overlying Dakota Sandstone. Copper minerals occur in pore spaces in the medium- to coarsegrained, bleached sandstones. The upper oxide zone contains the copperbearing minerals malachite, azurite, and tenorite, while the lower sulfidezone mineralization consists of chalcocite, bornite, chalcopyrite, and cuprite. In late 2004, Constellation began constructing their new open-pit, heapleach, solvent extraction – electro-winning (SX-EW) operation. Several existing, small, open-pit mines (the Sentinel, Centennial, and GTO) from the old Blackbird operation will be incorporated into the new mine. The current reserves at these three mines are estimated at 36,700,000 tons averaging 0.51% copper. In addition, Constellation has additional copper resources just east of Lisbon Valley in Colorado and is exploring for mineralization along the Lisbon Valley trend to the southeast. The Lisbon Valley project anticipates mining about 18,000 tons-per-day ore with a general process flow path of crushing the ore, stacking it on the leach pads, spraying the top of the heaps with a solution to dissolve the copper from the rock, and piping the resulting mineral-rich, “pregnant” solution from the base of the pads to the SX-EW facility where the copper is recovered. The SX-EW process leaches copper directly from the coarsely crushed ore and electrically plates out copper metal from the pregnant solution, without the usual concentrating and smelting processes. The product is 99.99% pure cathode copper. Constellation anticipates that production will begin in early 2006. Capital costs for the Lisbon Valley mine and plant are projected at about $55 million. Constellation will have an annual operation cost of $18 million in goods and services, $10 million in taxes, and $9 million in wages to the 146 staff. The Utah portion of the copper project has a seven-year mine life. The Lisbon Valley copper project should be an important economic benefit to the people of southeastern Utah.